It's amazing how much creativity nail care designers prove with every nail polish collection launch as every time new pigments take over the nail color scene, pigments that push the boundaries and that aim to underline personality and style. This winter, China Glaze channeled all its energy to create an innovative nail polish collection that will sweep nail art enthusiasts off their feet, which features a special high-pigment formula that can intensify its color once a top coat is applied over it. 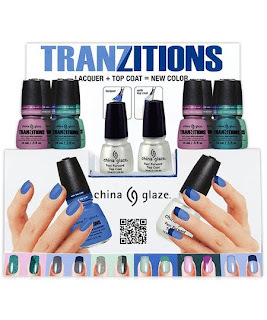 The innovative nail polishes featured in China Glaze's Tranzitions collection provide the easiest means to a fuss-free two tone manicure that will instantly draw attention and that will make your nail pampering time a delight, as achieving fabulous gradient color nail art has never been easier. Just apply and sweep on a top coat in the desired pattern to help activate the color and give it a more intense look! The new innovative formula is also chemical free meaning ingredients such as DBP, Toluene and Formaldehyde, which can cause damage to the nail and the color provided with every application is long lasting and chip-free, so you can enjoy your fabulous manicure for longer. Check out BecomeGorgeous.com for the latest news in hair, makeup and celebrity style so you can always be in the know on the key looks of the season! The brand essence made a collection like this too! OOoooh I didn't know that! I had only heard of the ones from BarryM before! have I told you that Essence has color changing polishes? Ante na doume pote 8a er8oun kai kata 'do. I would loooove to try these!they look awesome!! Me too! Can't wait for them to come out!